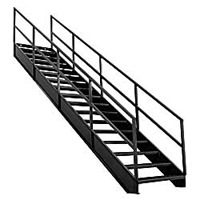 Create strong and reliable access to mezzanines and elevated platforms with Industrial Stairways. Meets or exceeds OSHA standards. All-welded construction ensures more strength and structural rigidity than conventional "bolt together" units—designed for 1,000 lb. moving load! Units have 10" channel stringers for enhanced stability, and 1 1/2" square—tube handrails. Stair treads are a generous 36" wide and feature technologically advanced Grip Strut tread for slip resistant footing. Other widths are available.